Construction Manager Richard Binns checks on the progress of a work crew assembling bee habitats in Fellowship Hall at Second Baptist Church. From the left: Gloria Magliozzi, Louise Lombard, and Donna Drewnowski. They were part of a morning program that built about 20 boxes. In recent years, the news has spread that our local flora, including essential food crops, is threatened by the shrinking population of pollinating bees. So on March 3, about 50 people interested in doing something about it gathered at the Second Baptist Church at 3 p.m. in a program sponsored by the Green Team of the church, the Friends of the Farm at Hilltop, and the Suffield Land Conservancy. 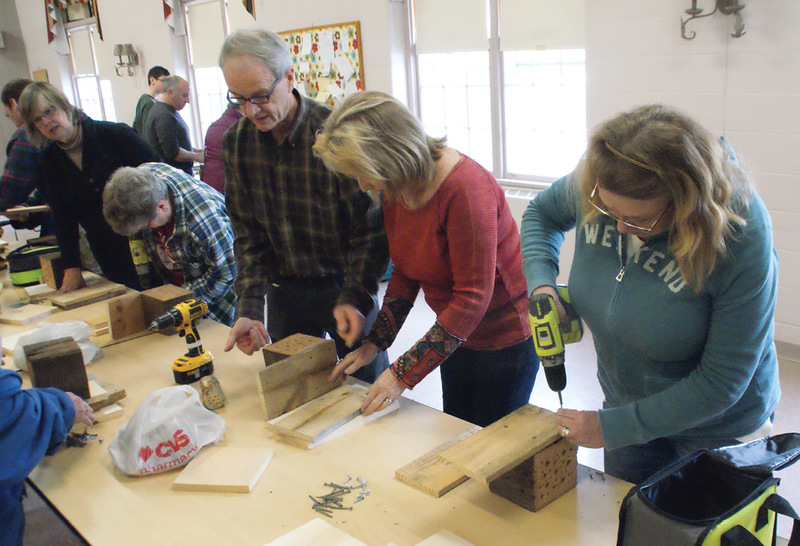 After learning more about the problem from Bobbie Rodgers, a life-long, nature-loving, conservationist, participants built bee boxes to take home and install to help pollinating bees multiply. Publicity about dying bee colonies has put a focus on honey bees, but Bobbie explained that there are a great many other species of native bees doing the vital pollination, many of them not living in the honeybee hive colonies we learn about as children. And many don’t bite. These pollinating bees, some quite tiny, live in various natural sites such as small holes or hollow stems. The bee boxes to be built would provide such spaces. Bobbie explained how to install the boxes and also encouraged everyone to plant pollinator-friendly flowers throughout the season and avoid pesticides, which often kill more good bugs than bad. Construction began after the lecture. Richard Binns and some friends from the sponsoring organizations had precut the lumber for the boxes, purchased the necessary screws and nails, and assembled a number of electric drills and other tools. About 20 boxes were built. They looked a bit like little bird houses, but instead of a single nesting space, they provide many little hideaways for the bee larvae to spend the winter, then mutate to become adult bees. Some of the hideaways were holes of various sizes that the builders drilled into solid wooden blocks; others were short tubes of bamboo, reeds and various other plants with hollow stems, packed together in another part of the box. At the end of the session, the happy builders took their boxes home to install when the weather permits. Binns reported that donations by the participants would pretty much cover the cost of the materials.